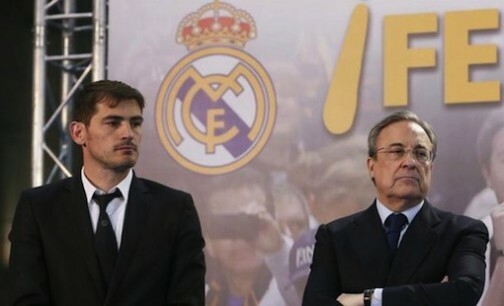 Florentino Perez has sensationally been accused of disliking black players by Iker Casillas’ agent. Santos Marquez, who insists the Real Madrid president ‘is not racist’, expects Perez to leave Real over the saga of Casillas’ departure and has hit out at his behaviour in an interview with Spanish paper AS. Marquez, who also confirmed that Casillas turned down a number of Premier League offers to join Porto, accuses the president of having not ‘utter[ed] one single truth in many years’ in an ugly conclusion to his client’s long Bernabeu career. Casillas, who was in tears during his final Real press conference last week, was pushed towards the Madrid exit as Real looked to move for Manchester United stopper David de Gea. FIFA agent Marquez, who has also represented Claude Makelele, says his relationship with Perez first broke down over the midfielder’s transfer to Chelsea in 2004. Asked why his working relationship with Perez ended, Marquez said: ‘For Makelele, for a lack of respect. Florentino doesn’t like black players; he’s not a racist but he doesn’t like them. The galactico culture of buying the world’s top players for huge fees has long been a topic of interest at Real, and Marquez says the resulting dynamic of favourites within the dressing room has led to an ‘ugly’ situation. Welsh winger Gareth Bale – backed to play in a No 10 role next season – is one of those said to be given special treatment by the 68-year-old president. “The squad knows who they (Perez’s players) are and so does the coach. The only clash he had with (former coach Carlo) Ancelotti was over Bale,” Marquez told AS.